In collaboration with Digiarty Software (MacXDVD), 3 copies of MacX HD Video Converter Pro for Windows each worth $29.95 are up for grabs. The giveaway closes on 22nd July and winners will be announced on 23rd July. Simply leave a comment expressing interest in this giveaway (even better if you can mention how this tool will be useful to you). Please mention a valid email address (won’t be published) but it will be used to send the license key. Winners will be randomly selected using the Giveaway Winner plugin. This video converter software has more than 370 built-in video and audio codes, obviously, you can easily compress video file size and output videos in specific formats as per your need, such as MKV, MP4, H.264, 4K, MP3, AVI, WMV, etc. size With so many formats ready for viewing on iPhone 5S / 6 / 6S/ 7, iPad, Android tablet and phone and so on, you could simply load the movies and video stored on your computer, choose your device profile and play them anywhere anytime. 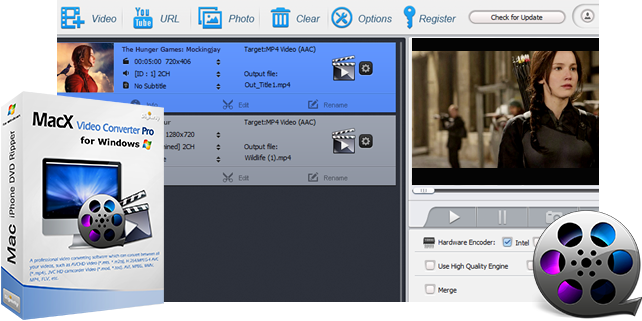 Incorporating Intel’s Quick Sync Video technology, MacX HD Video Converter Pro for Windows exploits a series of optimizations between CPUs and other computer components to speed up the video converting speed. As an award-winning video converter, MacX HD Video Converter Pro for Windows brings more than just video converting capability, it lets you download videos from the Internet and converts them to be compatible with mobile devices. This is particularly useful to save some music to your phone in case the Internet connection is weak. It can also work as handy video editor and photo slide show maker. You could trim the video length, crop the unwanted areas, merge multiple video clips into one single video and add subtitle and customized watermark to the video as you like. It can also process some images into a slideshow with background music. Update : Winners for this giveaway have been declared here. i recently bought 3k tv in a big money hoping to watch 4k video content. to my surprise, i hardly see 4k content that is supported my tv. my tv supports h265 codec in mkv container format. so i need to convert whatever 4k videos in any format to the required format. so kindly help me to enjoy 4k video technology in my recently bought tv. I Very like this app, because I used in Mac too, very useful, powerful. It shorted my work time. I would like to use it to convert my video collection.